Another gorgeous sunny day calls for another summer work day outfit for you guys. 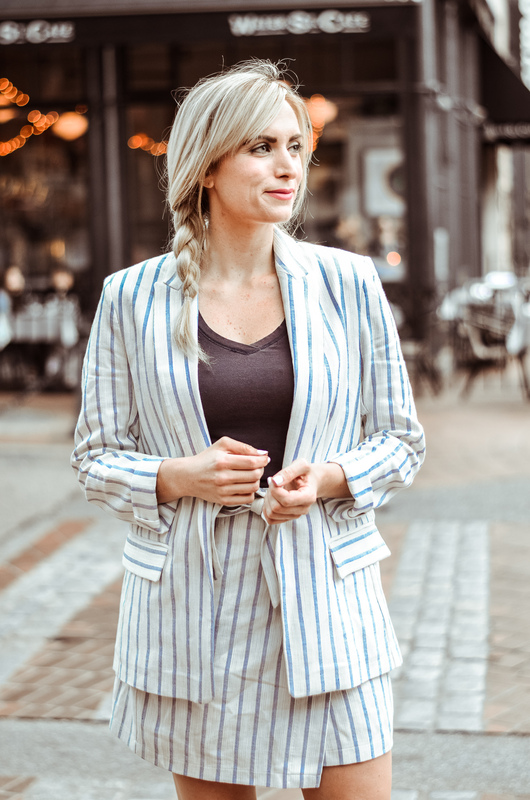 I have been on a skirt suit kick lately (in case you missed it – this 80’s inspired pink suit is my new obsession) and this linen striped skirt suit caught my eye as soon as I saw it. In addition to being a great suit to beat the summer heat, the striped skirt suit is also right on trend with it’s wrap skirt style waist. The tie is made to be worn at the side – which looks great when the skirt is worn alone. To have it sit nicely under the blazer though, I tied the bow in the front and like it just as much worn that way. To finish up this outfit I went with just a plain navy tee shirt (one of my favorite basics under a suit) and some navy suede heels. My navy suede heels are from last season Boden, so I’ve linked up some similar pairs below since my exact ones are no longer available. Best part – both pairs I’ve linked up are currently on sale! I shot these photos in one of my favorite neighbourhood’s in Vancouver; gastown. The primary courthouse that I work at is in this neighbourhood so I’m lucky enough to spend a lot of time here.. even if it is just running out for coffee breaks! 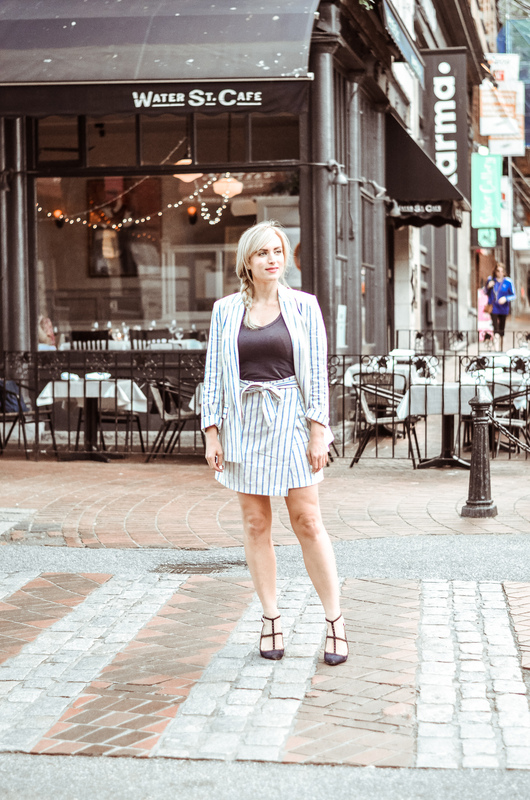 Haha which reminds me- this striped skirt suit definitely passes my ‘can you really wear it all day’ test as I have definitely done some treks from the courthouse to two of my favorite coffee shops in this outfit! I’ve been thinking of doing a blog post on my favorite spots here in Vancouver. Would you guys be interested in that? And, if so, would you be most interested in: 1) the best coffee shops 2) my favorite local boutiques, 3) the best restaurants or 4) must-do activities in Vancouver? Let me know in the comments below! "What to Wear to a Freezing Office in the Summer"
"Spring Date Night Outfit Idea: Floral Long Sleeve Mini Dress"
This outfit is super cute! And I loveeee these photos! Yes. My family and I went to Vancouver last May and we loved it. We hope to come back, and spend more time in the city. I’m so glad you liked Van! And that is great you’re hoping to come back! Alright I will definitely start working on a post on Vancouver! Beautiful outfit! Would love to know must-do activities! Thanks Joling! And okay sweet, I will start working on some must-do activity content! Thank you so much! The skirt is great eh! It would be great even just with a white tee and some sandals for a summer day! And okay cool, I’m so glad you’re interested in that! Ill get to working on it! This set is ADORABLE! Love how you styled it! Great suit and is perfect for summer! I have a striped one but with shorts for the summer that I got 2 months ago that I wore a few times in Miami and around Florida. and love it! It’s a great twist on the suit trend for the season. Thanks Miki! Oooo that sounds like such an awesome suit! I’ve definitely been wanting to try out a shorts suit this summer. I think I want a yellow one! This outfit is so chic and it fits you well. The striping of the skirt and blazer add so much sophistication. Thank you so much Lesha, that is so kind! The linen fabric is a suitable option for the base of such a suit. A hot period will not interfere with a walk in a stylish and beautiful image. This outfit is universal so that every day you can change the T-shirt and thereby completely change the look of the whole image.